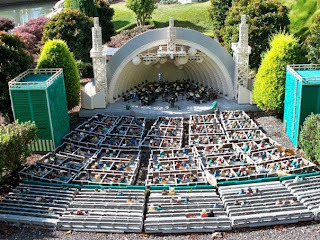 For as long as I can remember, I've been a fan of the LEGO franchise. Whether it was my very first set (1990's Beacon Tracer) or my most recent purchase (Wreck Raider from the new Atlantis line) or any one of the thousands of creations I've made in between, the simple act of snapping little plastic bricks together has never failed to put a smile on my face. I've also squeezed hours of enjoyment out of LEGO video games of the Star Wars and Batman varieties (less so for Indiana Jones). 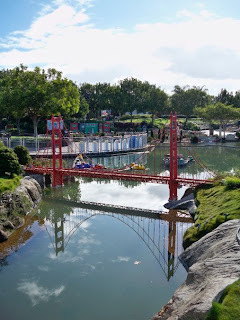 So when my girlfriend expressed an interest in visiting Legoland California for her birthday, I quite literally jumped at the opportunity. 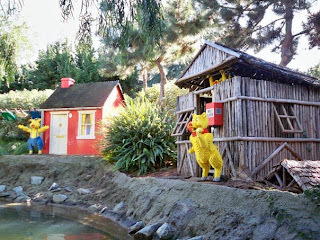 I've always believed in the untarnishable reputation of Disneyland as the world's most magical place, so despite my relative proximity to Legoland - it's situated in Carlsbad, CA, a mere hour and a half's drive from downtown LA - I've never made the journey, opting instead to repeatedly patronize the Mouse House's theme park. Needless to say, I was both excited and a little nervous for my journey into uncharted amusement park territory. 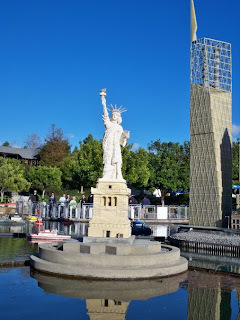 Follow me through the jump to read a Volvo-driving, LEGO enthusiast's take on Legoland California. Why mention that I drive a Volvo? 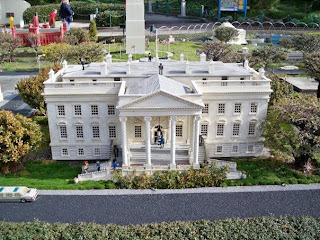 Because Legoland offers preferred parking for Volvos, for the same exorbitant price (twelve American dollars), but which situates you several feet closer to the entrance. 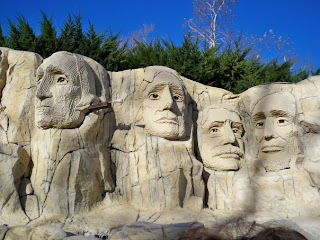 Unfortunately, the birthday party wasn't traveling in my car, so we had to settle for the regular parking, from which we had to climb up a hill of mulch to get to the turnstiles. But Volvo's contribution to the park didn't stop with the parking lot. 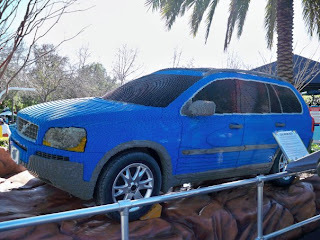 The Swedish car giants also sponsored attractions such as the "Volvo Driving School" (basically go-karts for children 6-13 years) and the "Volvo Junior Driving School" (for children 3-5 years), as well as a life-size model of a blue Volvo XC60, built with 280,000 LEGO bricks. 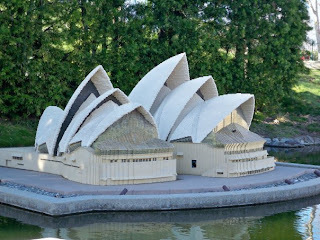 Those Scandinavian countries sure do stick together - LEGOs were invented by Danish carpenter Ole Kirk Christiansen. The park is structured much like Disneyland with various themed "lands." The Volvo display can be found in Fun Town. Pirate Shores features a Splash Mountain-esque flume ride and one of those swinging fairground pirate ships that also rotates on its axis. Castle Hill has various medieval-themed attractions, including an extensive jungle gym and a roller coaster (closed the day we were there). 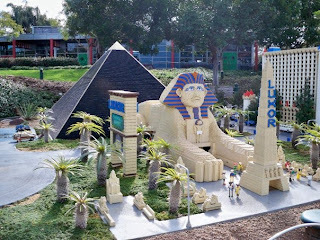 Land of Adventure's main draw is a dark ride that takes you on an Egyptian adventure. "Lost Kingdom Adventure" copies Buzz Lightyear's Astro Blaster in that each rider gets a pistol-shaped laser pointer, and targets are placed strategically throughout the ride. 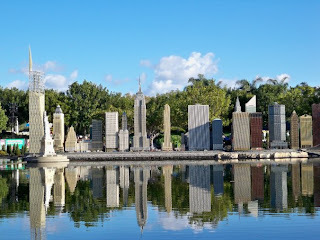 The whole of Miniland USA purportedly includes 40 million LEGO bricks - 6.5 million alone making up the NYC model. Maybe this is a childish observation, but "LEGO master builder" seems like a dream job to someone with my interests/qualifications. The highlights of the park for me included the absolutely bone-chilling "LEGO TECHNIC Coaster." It had a pretty decent short yet stomach-turning drop, but the fear was derived from a particular quality of the construction, which made it seem as if the car would go hurtling off the track with each sharp turn. 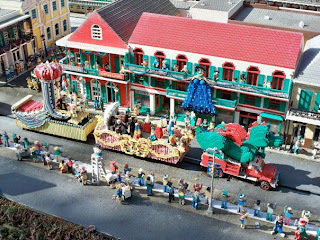 There was also the super-chill "Fairy Tale Brook," a water ride resembling Disney's Jungle Cruise, but featuring LEGO reenactments of favorite childhood fairy tales in place of animatronic wild animals. But the most impressive ride had to be the "Knights' Tournament," which was basically two roller-coaster seats attached to a pylon that twisted and turned at breakneck speed and ball-splitting angles. You could choose from five levels of intensity, and we obviously had to try it on the fifth and highest level. On that ride, I lost so much loose change from my pockets that I didn't even have enough left to buy myself a souvenir penny. 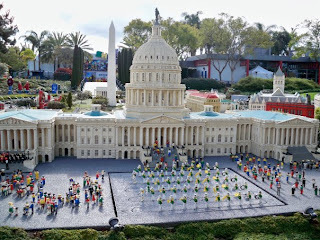 Of course, any discussion of LEGOs begins and ends with their toy products, and the myriad gift shops placed strategically around the park (almost as numerous as the face-painting and caricature portrait stations) gave visitors ample opportunity to browse the newest LEGO sets. I'm always confused by the process that governs which LEGO sets remain available in stores. Old favorites from the Indiana Jones collection still line the shelves, but there were precious few new-and-improved Castle/Pirate sets to be had. And of course the LEGO Batman line is still sadly out of production, despite the success of "The Dark Knight" and the LEGO Batman video game. Another console-bound LEGO franchise, Harry Potter, was sadly underrepresented, the available products limited to a Hagrid keychain. The newer sets are pretty cool: a return to the undersea (Atlantis), underground (Power Miners), and outer space (Space Police) themes. When the LEGO company was founded in 1932, the bricks were still made out of wood. Since then, incredible technological advances and damn crafty developers and designers have ensured an amazing product for decades (and hopefully for decades to come). And in these days of corporate corruption and greed, it's refreshing to see a company that treads cautiously and intelligently into new ventures and that has wholesome and intriguing ideas about better business practices. But what else should one expect from a company with the motto "kun det bedste er godt nok*"? * Only the best is good enough.